The Pure Wave CM7 by the company Pado is a very popular handheld and cordless percussion massager. These type of massagers have become very popular recently and there are a lot on the market. However, the CM7 has separated itself from its many competitors due to its unique design. CM7 is the flagship model and is both versatile and powerful yet affordable. If you are interested in the CM7 and want to learn more, then this is the right review for you. My goal is that when you have finished reading you will be able to make a better-informed decision whether it is the right massager for you or not. Why Get A Handheld Massager At All? Before we get into the specifics of the Pure Wave CM7, I think it would be very relevant to cover a few ideas for why you would want to get this massager or any other massager in the first place. To be perfectly honest, I doubt that anyone would prefer a massage device over the good old manual hand massage by someone who is really capable. But that was never the claim, and if someone actually does prefer it then it must be for some specific reason like the ability to penetrate into some thick muscle tissue, e.g. treating some scar tissue in the thigh. In any case, the CM7 is a very convenient and cost-effective treatment method. If you have small to moderate issues e.g. tight neck and upper back, the CM7 could spare you from going to a masseuse, physical therapist or chiropractor. And if your issues are worse than that, the CM7 could likely help you recover faster and make the treatments less frequent or fewer. There really is a massive amount of anecdotal evidence that these kinds of massagers work and the CM7 is no exception. You can just take a look at the overwhelmingly positive feedback on Amazon. There is also scientific evidence backing up that both percussion and vibration massage therapy works, which is exactly what this massager does. Besides simply relieving sore muscles, the massager can potentially 1) speed up muscle recovery by dispersing built-up lactic acid and increasing blood flow to the muscles and 2) increase your sports/gym performance by reducing muscle stiffness/tightness. Some massagers do work with essential oils as well. The CM7 is on of those. Most people have a busy and stressful life. Overexertion and stress tighten up the muscles and joints. Not that I want you to think particularly highly of me, but I get this issue even with many breaks from sitting down throughout the day, being aware of my posture, having decent ergonomics at my desk, and working standing up from time to time. I am also moderately active with doing weight training and yoga. But I have to use a computer for work. After all, there is only so much you can do right? If you want to read more about posture, then you can check out something I wrote about fixing rounded shoulders and a forward head. The CM7 is cordless and has a so-called dual motor design. Its main massager that is placed in one end operates in the speed range of 1500 – 3700 strokes/percussions per minute (RPM). Its second massager that is in the other end operates at 11000 RPM micro-vibrations, which is great for delicate tissue like your scalp or around joints. This design is special and not seen on many massagers. What it means for you and is that the unit is much more versatile and that you can get a broader range of “massage options” treating different needs. There are 6 different massage heads for the main massaging unit all included in the purchase. When pairing the many speed options with the different massage heads you can actually get a massage anywhere from subtle to very intense. The massager has a built-in safety function so if you apply too much pressure it shuts off. But you can be sure that the intensity is enough to penetrate deep into thick muscle tissue like your thighs. It has a powerful built-in rechargeable lithium-ion battery with 7.2 V and 2.2 aH. It has a relatively long battery life of reported 180 minutes so you won’t have to worry about constantly recharging. However, some users have reported that the battery life shortens over time at a faster rate than should be expected. For recharging 1 hour or more should be expected. The massager is truly a handheld massager since it is neither big nor heavy. 42 cm x 7 cm x 10 cm (L x W x H). In other words, you won’t be breaking your arm when operating it and you can easily bring it with you to the office for example. Because it has a bit of length and a shaft to hold on to, it is very easy to reach your neck and back by yourself. This is not the case with all handheld massagers. 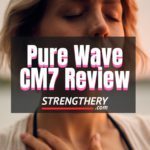 The Pure Wave CM7 customers are generally very positive towards the massager. It is rare that you find a product like this with such a high rating on the large online retailer sites. It is even recommended by professionals, which you have probably noticed if you saw any of their marketing material. Such information should always be met with healthy scepticism but the CM7 is also recommended by unaffiliated and unbiased professionals. You can see for yourself in this youtube video by two great physical therapists. Check out what people have to say about the massager on Amazon. The CM7 is a great and relatively affordable massager. It is powerful and has the option to both give soothing and relaxing massages or very intense massages. It can even be used together with essential oils if that is something you like. Its length and shaft make it easy to reach the neck and back by yourself so you don’t need assistance. That is probably a big reason for why you would want such a massager in the first place. Some say that the massager is a bit noisy, but from what I can understand it is a level of noise to be expected from these machines. It is not more noisy than others. A critique would be that although the CM7 reportedly has a battery life of 180 minutes, a lot of customers experience a reduction over time at a faster rate than they expected. In addition to that, the battery is built-in. So when the battery eventually dies the massager can’t be operated. The company has tested the battery thoroughly and says that it should last at least 2-4 years of frequent use. The company does offer to replace a broken battery but it will cost you battery cost + replacement fee. How Does It Compare To Other Massagers? There are many different handheld massagers on the market, and it can be hard to discern which one is the right for you. This massager differentiates from other similar devices by having a broad variety of massage options with its variable speed range, dual-motor design and a lot of massage heads included. Some massagers only offer one or two speeds and only has one massage head. It is a versatile and good all-around massager for most body parts. It is not the most powerful massager out there, but you generally have to pay significantly more for those. Being cordless and lightweight it is easy to operate and position onto most muscles by yourself. Because of its length and shaft you can reach neck and back easily which is not the case with all massagers. If you want to check out other comparable massagers, then you should take a look at this list of handheld massagers for athletes. Don’t worry, you don’t have to be an athlete to put them to good use. Looks blissful, perhaps with a massage it would be even better? So is the CM7 for you? I would say that if you often have a sore neck and/or back from working at a desk, after a stressful day, or get very sore muscles after going to the gym then this massager could be very helpful. Not many things here in life come close to the relaxing feeling of getting your sore and tight muscles relieved by the hands of a professional massage therapist. With the CM7 you get the next best thing, conveniently available at your fingertips while also being cost-effective. Being cordless you won’t have to worry about getting tangled up while enjoying the massage. That is great to hear Deborah. I also like to use them post-workout. They have this pure wave and something that looks like the hypervolt massager at my gym. Not sure if it is a copy, but it works great.